Royal Ascot is the social event of the British racing and royal calendar. The crowds come out for the prestigious horse racing, of course, and to see the Queen and other members of the royal family. The racing meet held virtually in the Queen's backyard near Windsor Castle, has been a dress up royal event for hundreds of years. It was founded by Queen Anne and the first race was run on the original course in 1711. According to legend, Queen Anne was riding out from Windsor one day when she came across a large area of open heathland. "Why what a spiffing spot for a full gallop!" she said - or words to that effect - and the famous race was born. It was a very different race back then. Instead of the slender thoroughbreds that race today, the horses were heavy English Hunters. And they were required to carry a weight of 12 stone - that's 168 pounds. And each race consisted of three separate 4-mile heats. Queen Anne's role in founding Royal Ascot is remembered by the Queen Anne Stakes, the annual opening race. Today, Queen Elizabeth II is an avid race-goer and race horse owner herself. But being royal gives no advantage in the rarified horseracing circles when in comes to backing a winner. In 2013, when her horse, Estimate, won the Royal Ascot Gold Cup, she was the first reigning monarch to win it in the 207 years the race had been run to that point. Even for those who have never watched a horse race or bet on a horse ( what Brits call having a "flutter") Royal Ascot is irresistable because of the fashion stakes that always accompany it. 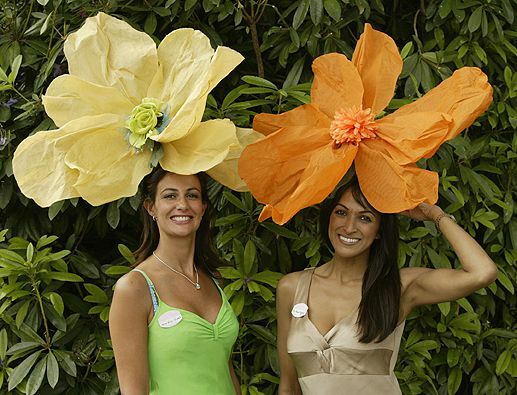 The real spectacle of Royal Ascot for most of us is the fashion parade of Ladies' Day. Hats are de rigueur and they range from the bizarre to the beautiful. But usually, the more outrageous the better. Fashions became so outrageous that in 2012 a dress code was imposed for the Royal Enclosure - so as not to shock the Queen we suppose. The code - minimal bare flesh, modest skirt lengths and appropriate hats for women, ties rather than cravats and morning suits or suits with waistcoats for men - were enforced by genteel fashion police, called dress code assistants. Waistcoats, ties, pashminas and "other items" were available at the gates to prevent "wardrobe malfunctions." But beyond setting a minimum size for hats, no one tried to restrain the exhuberant headgear. Open this photo gallery to see for yourself. Ladies Day at Ascot - An Architectural Statement? Ladies Day at Royal Ascot - Anyone for Lunch?